The Fellowship was fortunate enough to obtain a copy of ROBYN HOOD 2016 ANNUAL from Zenescope Entertainment. The story is by Pat Shand, with art by Larry Watts, colors by Slamet Mujiono, and lettering by Jim Campbell. It’s Marian and Sam’s wedding day, and Robyn is facing an uncertain future. Unfortunately the past is coming back to haunt her; both figuratively and literally. Who of her many enemies want to ruin the ceremony? More important, is Robyn ready to be on her own once again (assuming she survives the day)? Very satisfactory end to Pat Shand’s run on this title. A lot of old friends and enemies (both alive and dead) are back to end this series; with a nice mix of action, humor, and drama. Frankly, I’m sad that Shan leave this book, but excited to see what the new creative team has in store for Robyn. This has been a great series. If you have been curious about this book, this annual will inspire you to get the other issues (or the trades). 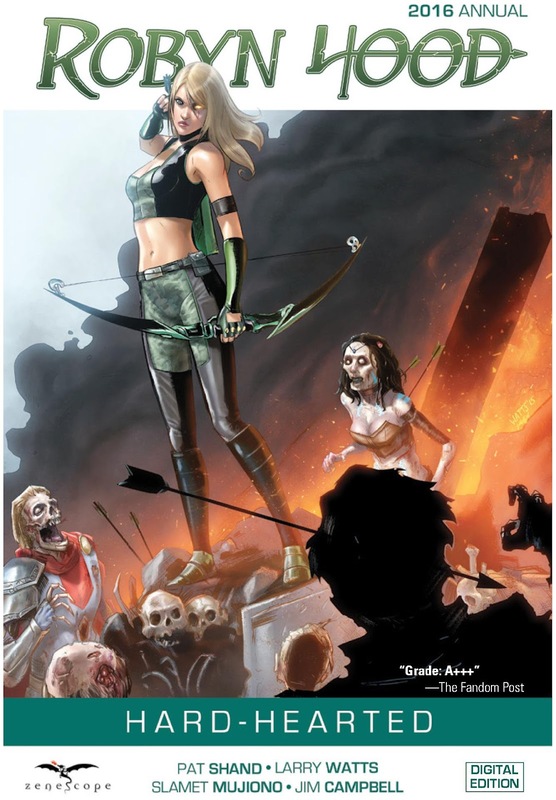 ROBYN HOOD 2016 ANNUAL is in stores now, or available for ordering at www.zenescope.com.